"I like green eggs and ham! I like them Sam I Am!" 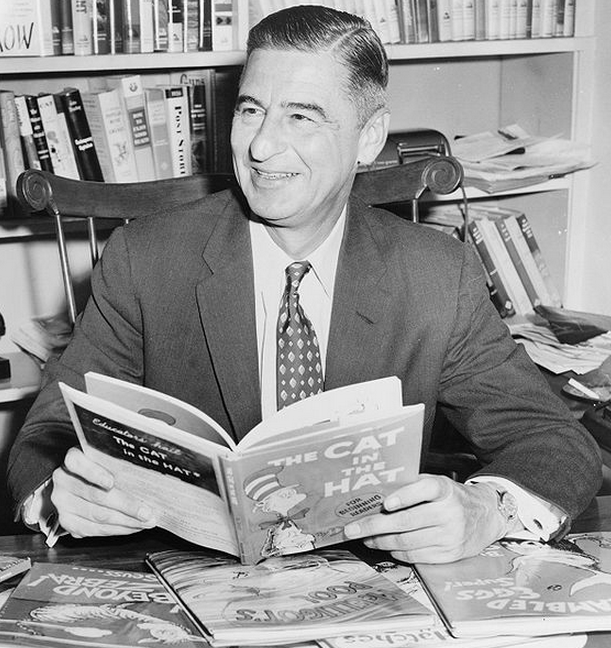 Dr. Seuss wrote more than 40 children's books and won countless awards including two Emmy Awards, two Academy Awards), a Peabody and a Pulitzer. The man behind the penname Dr. Seuss, Theodore Geisel, was extremely talented, very witty, imaginative, artistic and politically and socially conscious. His writing style was entertaining to say the least. Because of his early reader books, reading and learning became more fun for new readers. Today, the same children who grew up enjoying his books and the many transformations of Dr. Seuss's stories are now introducing Dr. Seuss to a new generation. Often times, the words he uses in his children's books sound like a lot of mumbo-jumbo. There's a lot of rhyming going on in every page. Nonsense and made up words form part of his stories. The locations and characters are often invented, but many parallel the people, places and situations Geisel experienced or observed throughout his life. He may have written his books for children but most adults enjoy them, too. If you are willing to suspend reality and enter the world of imagination, you will surely be in for a treat when you open a Dr. Seuss book. Welcome to the colorful world of Dr. Seuss! Dr. Seuss was the very famous penname of the man born on March 2, 1904 as Theodor Seuss Geisel. He hailed from Springfield, Massachusetts, USA. Geisel grew up to become a writer, a poet, a cartoonist, an animator, an artist, an illustrator, a composer, and a book publisher. He was of German descent and grew up during uneasy times. This was when German-Americans were put under the microscope because of the political climate in Europe at the start of the 20th century. Geisel was a bookworm who loved reading. His mother, on occasion, was said to have used books to bribe him to do things she wanted him to do. At a young age, it was obvious that Geisel was witty and artistic. After high school, he attended Dartmouth College in New Hampshire and later on Lincoln College, Oxford in the United Kingdom. He did not complete his studies in Oxford but instead pursued his love for drawing. He held different jobs during the beginning of his career. His wit and skill in cartooning were not wasted as his humorous articles were published in different magazines. Geisel entered the advertising world as an illustrator. One of his most famous illustrations was for Flit, a popular insecticide. He was also a political cartoonist for a New York City publication. During the Second World War, Geisel found himself working for the U.S. Army, specifically under the animation department. The film Design for Death that he wrote during his stint in the U.S. Army won an Academy Award for Documentary Feature in 1947. Advertising gave Geisel and his first wife Helen Palmer, whom he met in Oxford, economic stability. But it was writing children's books that made Geisel a household name and a multi-awarded writer. After the death of Helen, he married Audrey Stone Dimond in 1968. Geisel left this world on Sept 24, 1991. When he died, his second wife Audrey was by his deathbed accompanied by Theophrastus, the stuffed animal (a dog), which he had since he was young. Growing up, Geisel was nicknamed Ted. His illustrations, cartoons and commentaries were done and written under various pennames. His very first pseudonym was Peter Pessimist back when he was in high school. One of his more famous pennames was Theo LeSieg, which is Geisel spelled backwards. He also used Rosetta Stone and Dr. Theophrastus Seuss (taken from the name of his beloved stuffed animal). He also created cartoons under the names T. Seuss, Seuss, L. Pasteur, and D.G. Rossetti ’25. The very famous penname Dr. Seuss was born in 1928; it was the shortened version of Dr. Theophrastus Seuss. Many people thought the pronunciation of Seuss was similar to the pronunciation of the word "loose." This is not so. Seuss should sound like the word "voice." But the pronunciation that rhymed with "loose" stuck to this day. 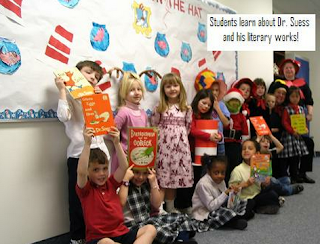 Students learn about Dr. Seuss and his literary works! His very first children's book was "A Story That No One Can Beat." It was rejected countless of times. Some sources said it was rejected by 20 publishers, some say 26, and some say 43 until Vanguard Press gamble on the book in 1937. Geisel wrote about Marco and the wonderful things he saw on Mulberry Street. It was a sort of commentary on how the author felt about Seuss wrote the story as a commentary about how he felt that the imagination of children were being stifled by adults. The book was later given the title "And to Think That I Saw It on Mulberry Street." Geisel's books were adapted for television, film and even a Broadway musical. Some books were turned into animated shorts while others were made into full-length movies. "The Cat in the Hat" and "How the Grinch Stole Christmas!" were both made into live action films with top actors from Hollywood. "The Lorax" and "Horton Hears a Who!" were transformed into full-length animated movies also with formidable actors lending their voices to the characters of both stories. One can find bilingual Dr. Seuss books with the original text in English together with the translation. Geisel's children's books have been translated to the following languages: Spanish, French, German, Italian, Russian, Afrikaans, Yiddish, Japanese, Chinese, Korean, Serbo-Croatian and Latin. Of course, as expected, the nuances of the original text, the metaphors, made up words, and the spirit of the story did not necessarily translate well in all these languages. Still, it was quite a feat for someone to have his works made available to children who spoke other languages or who are learning English as another language. 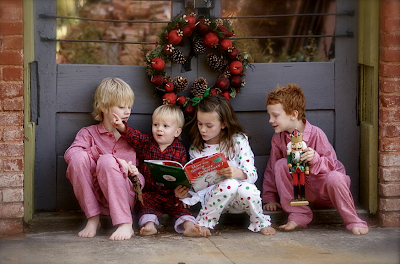 Four children reading the book How the Grinch Stole Christmas! by Dr. Seuss. Geisel's writing style, illustrations and themes combined perfectly to capture the hearts of children. He did not have kids but he knew how to entertain them. His rhyming style was fun to read quietly with one's eyes but more so out loud with feeling. The drawings in his books were simple yet attractive to young readers young. They were amusing, funny and cute. Geisel drew interesting objects and buildings that were usually droopy or lopsided and this added to the charm of the worlds he created. His later works were more colorful. Characters appeared to be in a state of motion even on a 2D medium. Dr. Seuss wrote in what can be called the language of children. His stories were down right imaginative and told in a humorous, rhythmic style accompanied by silly drawings. But behind all the perceived silliness are important lessons and messages that kids and even adults can benefit from. Dr. Seuss wrote about loving the environment, about rejecting racism, consumerism, materialism, taking responsibility for one's actions and more. "Horton Hears a Who!" came out in 1950. Its theme was internationalism and against isolationism. In 1957, "How the Grinch Stole Christmas!" The story focused on the consumerism and materialism brought about by the yearly Christmas Season. "Yertle the Turtle" was anti-authoritarianism. It came out in 1958, several years after the end of World War II. But even so, when one read it, it seemed to hint on anti-Hitler sentiments. In 1961, Geisel's "The Sneetches" was published. Race equality was the theme of this book. "The Butter Battle Book" came out during the Cold War period in 1984. It was pointing to the on-going arms race and how seemingly senseless the conflict was at that time. "The Lorax," which was published back in 1971, was made into a full-length animated feature film with Danny DeVito lending his voice to the title character. When Geisel wrote the book, it expressed his views on anti-consumerism and the environmentalism. It's been more than 10 years since Theodore Geisel's demise. Dr. Seuss, however, is still here to this day. He is in his children's books and in its many different adaptations. Most of all, Dr. Seuss is also in the hearts of many people from all over the world who grew up reading and loving his stories and who continue to share these with the young children in their lives. The man that created the characters Cat in the Hat, Grinch, Horton, Lorax and a host of other memorable characters taught the world that language learning through reading can be fun.